Like governments today, is the church “too big to fail” yet destined to fail anyway? We must face the problem and be willing to apply the solution. In an article entitled, On the Breakdown of Nations, a good point is made regarding the nature of large organizations. The article argues that when a nation becomes too large it will begin to break down under the sheer weight of its bureaucracy. It gets out of control and begins to consume its own citizens, becoming the very thing it set out to avoid. There comes a point at which even the most well-meaning and upstanding citizens cannot manage it. Does this principle apply to the Christian community? All evidence seems to answer in the affirmative. On an individual “church” basis, many believers cannot identify very many of the members, let alone have much say in how the church conducts business. And business it is; most are 501(c)3 corporations complete with CEO, board of directors, and trustees. Smaller congregations may not have this problem to the same degree, but the bureaucracy is there nonetheless. Yet there is a much bigger problem with the size of some para-church organizations and the “rock star” pastors who front them. Not only are such entities and persons unaccountable to all but secular laws due to crossing denominational lines, they also have undue influence upon many churches, seminaries, and teaching materials, and control vast amounts of money. Of course this is not easily proven statistically, but it should at least be taken seriously. The globalization of the church is not to come through political or organizational means, but by unity in the Spirit. The unity of the faith as taught in the New Testament is around truth, not human organization. The early church was very much a local network united in love and following “the teachings of the apostles”. It is surely time to go back to that model, in spite of all the trends for bigger and more complex everything. Modern technology is often blamed for lack of community, but it is like any other tool whose usefulness depends on the one wielding it. People today can network and collaborate as never before, without any oversight committee or governing board. Trends like crowdsourcing and mesh networking have shown the true power of interconnectedness, that being to provide services and actions that take advantage of a large pool of resources without a bulky bureaucracy. This is a relational model, rather than a hierarchical model. History has shown the church to be more of a follower than a leader when it comes to improving the way people get things done, whether it’s spreading news or solving society’s problems. There are individual exceptions of course, but that’s exactly the point. And just as we’ve seen example after example of individuals rather than huge corporations or governments solving problems such as clean energy or healthy food production, so also it has often been the individual Christian rather than a denomination who has had great impact on the church. But the church has historically not looked with favor upon individualism. We are told that “the log by itself burns out faster”, that there are no “lone ranger” Christians, and that only a pastor and church organization can guard against error. But as with governments and other large organizations, it is often the pastor and church through which error sprouts and grows. Yet again, as with secular government, the church is only as strong as its individual members. Generations have been conditioned into passive compliance and dependency, unable to mount any threat to the bureaucracy. And the solution is the same for both: training people to be individuals, independent and personally accountable. 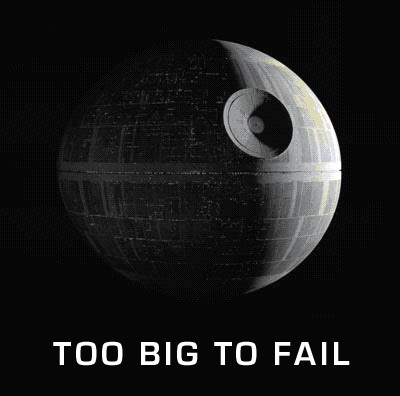 Without this, any attempt to quickly tear down the “too big to fail” organization will be very painful. Yet time is running out to accomplish this change in time for the inevitable collapse of all that is overgrown or clumsy.